Polishing Aluminum - NGWClub®, Inc. I posted this a long time ago (1996) in rec.motorcycles describing my experience with a Yamaha XS 650 I did a frame up rebuild on. I hope the info is useful to someone. My experience with this is based on years of working in the restaurant equipment fabrication ( s/s ) business where I had access to all the tools, equipment and chemicals commonly used. Undertaking this sort of project without these items is questionable. An alternative is to seek out this sort of company and more importantly a key person there, ply them with beer and sexual favors as may be required, in order to gain access to the facility, the tools, the supplies and the expertise of those within it. Good luck!! Polishing is essentially grinding but on a finer scale. Tools and techniques are very similar. The object is to remove excess material from the item such that the surface is as smooth as humanly possible, making it reflect light as opposed to refracting light. At the molecular level there are all manner of inconsistancies in surface condition. The objective is to minimize these. This is all based on an out of frame total rebuild. Beware that once you start this it will become addictive and you will want every item on your bike to sparkle and it canÃƒÂ¢Ã¢â€šÂ¬Ã‚Â¦ but when reinstalled will just make the rest look pitiful in comparison. For this reason I recommend doing this only as part of a rebuild job along with painting the frame, tank, etc for contrast effect. MOST important is a commercial grade pedestal (or bench) grinder. 3 hp minimum, 220 volt, (3 ph if possible), 5000 rpm, with an 8 inch diameter buff wheel capacity, and securely bolted to floor. Second is an end grinder. 6 amp motor, ( Milwaukee makes the best ) with a 5 inch diameter buff wheel capacity. A good quality face shield and work gloves. Coveralls (unless you donÃƒÂ¢Ã¢â€šÂ¬Ã¢â€žÂ¢t mind looking like a coal miner when done). GOOD lighting (no such thing as too much) fluorescents work well. Storage table(s) and shelves to lay the assorted bits on. Solvents and pans for cleaning bits prior to polishing (and afterward). I'm not up to date on the current clearcoat products. Eastwood is a good company but I also understand POR makes one too. Maybe start a thread on it or search the forums? Here's your link for the Por product. My Norton has a lot of aluminum. Have you tried Autosol metal polsih after you finish with your compounds? I get the best results for final chrome-like finish, if that is what you want, with Autosol metal polish and a buffing wheel. In fact, I can go from fine Scotchbrite directly to Autosol without a lot of grinding and friction as it is a chemical rather than abrasive peel. Last edited by billbmsn on Mon Jan 21, 2008 10:49 pm, edited 3 times in total. Solvol Autosol comes in small tubes! That there Norton is a whole lot of small tubes!!!!!!!!!!!! A good, quality paste wax will help to prevent oxidation, just as it does on painted items. Bill, that is one beautiful Norton, Nice work. I also use a wax type treatment rather than clearcoat, I use MAAS paste. I have had two experiences using clearcoat products, and they both left the polished aluminum dull looking after being sprayed. Once I get the aluminum polished and waxed, I dont have any problems with further oxidation, besides, I like the idea of being able to quickly buff out a nick or scratch without having to go through the hassle of removing clearcoat and prepping the surface all over again. Just my .02 worth, Geno. I've tried several clears on polished ally. Results seem to depend on the grade of alloy, oddly. On this one particular bike everything was polished up till shiney as a shiney thing. With lots of bare alloy (engine, rims, forks, yokes, risers etc etc) I was keen to protect it all. Normal rattle-can acrylic clear. Some parts were fine and clear, others pretty cloudy. Seemed to depend on the alloy grade, all parts were pretty equally shiney before clearing. Special rattle-can clear intended for alloy. Crazed after a while, let in moisture. Not impressed. In fairly pre-internet days it took a bit of tracking down, a waste and more work to get it all off. Water-based brushing clear intended for alloy. Easy to apply, left the shine well. Useless at weather protection. In the end on this bike I gave up and went with regular waxing and attention. That all said though, they do love to salt the roads here and it does test things out pretty hard if you ride all year. Haven't tried 2-pack, but I wonder how well/how long it'd stay put on a shiney surface. I'd like to see an example of clear powdercoat too, that could be really good. Old Fogey wrote: Solvol Autosol comes in small tubes! Autosol is interesting stuff. I use very little of it. It builds up a black residue on the buffer or rag that actually continues to work - you don't need to clean it off as you do with compunds. I just add a tiny dab of Autosol to the black residue every so often to keep it moist. The small tube will last me a decade. I don't put any wax or clear over the aluminum, and it stays shiny. Egad, let me resize that photo! 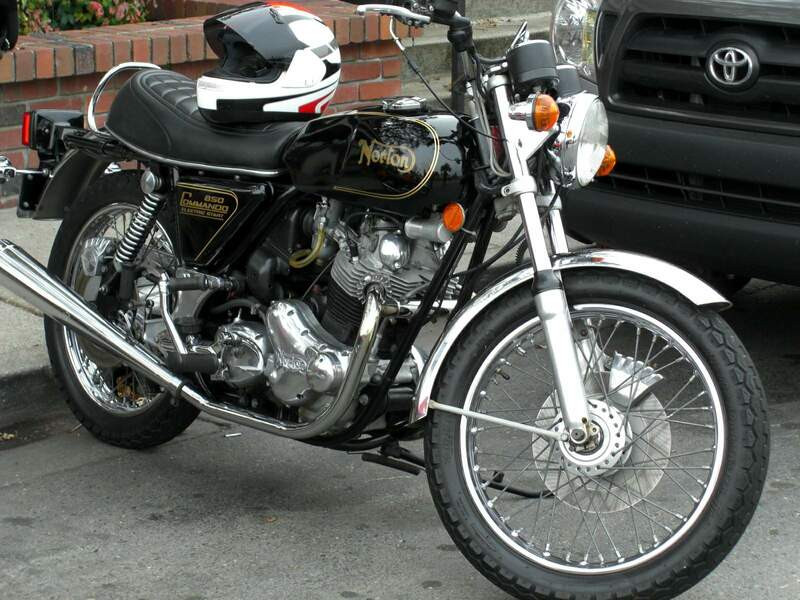 Geno wrote: Bill, that is one beautiful Norton, Nice work. I also use a wax type treatment rather than clearcoat, I use MAAS paste. I have had two experiences using clearcoat products, and they both left the polished aluminum dull looking after being sprayed. Once I get the aluminum polished and waxed, I dont have any problems with further oxidation, besides, I like the idea of being able to quickly buff out a nick or scratch without having to go through the hassle of removing clearcoat and prepping the surface all over again. Just my .02 worth, Geno. Autosol is a chemical metal polish, on the order of Semichrome or Flitz, not a wax. I haven't waxed over the aluminum, but the bike is stored indoors and hasn't seen rain in ages. It does get ridden on Norton Club rides, although I must say my GoldWing has displaced the other bikes as my favorite ride since I got it in October. I have clearcoated the valve covers on my CBXs with plain acrylic clear. It holds up well for about 4-5 years. It doesn't yellow quickly but it degrades over time. Common paint removers will take it off for refinishing. Thanks for all the great input. What I did have on the aforementioned aluminum was Meguires showroom glaze (a light polish?) and since I have to store the bike outdoors (with a cover), the protection probably doesn't last very long. Before I go the clear-coat route, I'll try a good paste wax. Incidentally, Solvol Autosol is also great for removing scratches form plastic components such as rear light and indicator lenses. Old Fogey wrote: Incidentally, Solvol Autosol is also great for removing scratches form plastic components such as rear light and indicator lenses. So, I guess it must have some abrasive in it too. Didn't realize that. For plastic I use 3M Finesse-It II, which is a fine paint finishing compound.